SASKATOON, SK – 21st Street Brewery has announced the release of a new beer to raise funds for the Saskatoon Public Library. Knowlympics is a soft, hazy ale featuring a unique Canadian grown-hop called Wild Turkey! You’ll smell notes of lemon and honey in the aroma and taste a hoppy, lemon/lemongrass flavour before a clean, dry finish. 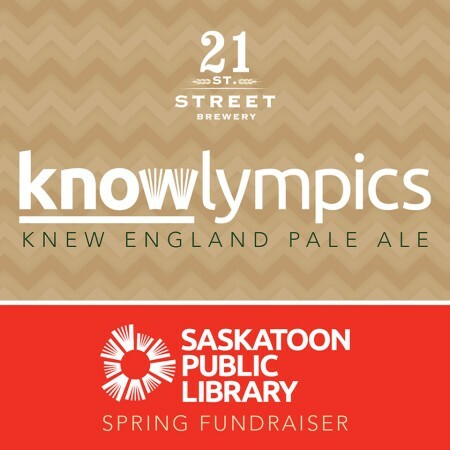 Knowlympics is on tap now exclusively at Winston’s Pub (243 21st St. E., Saskatoon) upstairs from the brewery. $1 from every pint and $2 from every growler sold will go toward funding SPL’s STEAM (Science, Technology, Engineering, Arts, and Math) educational initiatives.